There is always a sense of certain trepidation when a new season of an acclaimed television show is released, and this was certainly the case with the third season of Sky Italia’s Gomorrah. We have questions such as, have the characters got anything left to say? Has the 12 month gap between series dulled the senses? Do we still care? There shouldn’t be with Gomorrah. In fact, if anything, Season III of Roberto Saviano’s account of Neoplolitan Mafia life that makes The Sopranos look like The Simpsons. With Don Pietro murdered, there is a void to be filled in the underworld of Naples. His son Genny takes control, using the opportunity to settle old scores. The survivors of the remaining factions, exhausted by the warring and massive police pressure, have suffered drastic financial losses and make peace. So with Avitabile in prison for another year, Genny now has to reign over North Naples and Rome. Though Ciro, on the other hand, has had his revenge but his dreams and his family have been destroyed. When Ciro has to return to Naples, he forms a new powerful partnership with the young and ambitious Enzo; a light that was once extinguished in Ciro’s eyes reappears. Enzo, with Ciro’s help, learns how to be a real boss and to take what he is entitled to. It is a time of drastic change for all of them. If you haven’t been watching Gomorrah, then get on board. Packed with intrigue, violent action, elegiac storytelling and as dramatically authentic depictions of the inner workings of gang-life - it is a series that breaks new ground in television drama with every episode. Marco D’Amore’s Ciro is fabulously portrayed. At once deeply troubled and highly motivated, D’Amore exudes a quiet confidence that sweats into his character’s psyche and so makes his actions all the more credible. The same can also be said of Salvatore Esposito’s Genny. Oftentimes as stilted as considered as he is authoritarian and ruthless, Genny is a figure stitched from golden silk and tightly woven. The man who would be king, in the hands of Esposito, Genny is a fragile monster in the mould of Tony Montana. What really makes the show - and this season in particular - is the role women have to play. Behind every ‘great’ man, there may be a woman. In the Naples underworld, this is certainly the case apparently with Cristiana Dell’ Anna’s fabulous portrayal of Patrizia oozing power, charisma and malevolent intent at every turn. If there is a problem, it lies in the supposed ineptitude of the Italian police. Despite the slayings, there is absolutely no mention of anybody being afraid of capture or, apparently, investigation. Indeed - as might be the case, allegedly - it is as though the entire Italian police force is in the pay of the mobsters to the extent as they not so much turn a blind eye but rather have poked them out with blunt sticks. 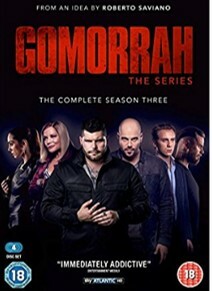 This said though, Gomorrah Series III delivers across the board. A richly entertaining crime drama that’s as brutal as it is subtle, as delicately crafted as it is on occasion stereotypical and about as far away from the truly awful Matteo Garrone directed 2008 movie as one could wish for.